HomeBuying GuidesWhat is a Cairis? What is a Cairis Carrier? with a buckle fastening and ‘wrap shoulder straps’ which provide adjustability, comfort and support. With the Cairis baby and toddler carriers, it’s quick and easy to carry your child on your front or back. The Cairis features our unique Strata-linea® waistband, which prevents digging in at the waist & avoids any discomfort from the buckle. 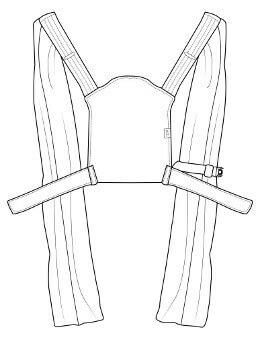 Our specially developed ‘wrap straps’: padded shoulder straps that fan out, provide cushioning over your shoulders and allowing you to spread the fabric out under your child to increase support. The Oscha Cairis has been approved by the International Hip Dysplasia Institute as a ‘Hip Healthy’ product, this means it will hold your child in the ‘M’ position which is optimum for hip development. The Cairis carrier is available in two sizes, each with unique features to suit your child as they grow. The baby Cairis is highly adjustable and suitable for carrying from newborn up to around 30 months old, at which point the toddler Cairis becomes more comfortable. Extra padding has been added to the waist band of the toddler Cairis for additional lumbar support. The body panel has seat darts & ‘legs out padding’, contouring a larger child’s shape & aiding comfort. Suitable from 2-5 years. meaning the baby Cairis is comfy and safe from newborn to around 30 months. The fully reversible waistline has no stiff foam and can be rolled to adjust the height of the sling. This is particularly useful when carrying a newborn. Use the ‘Cynch’ provided with your Cairis to create the correct panel width for your baby, it should be from knee pit to knee pit to support their natural position. All of our Cairis carriers come with a detachable hood which provides head support for sleeping children. This can be used to narrow the seat of the carrier. A Cynch is included in baby Cairis, but can be purchased separately for use with the toddler size. Strap protectors fasten around the shoulder straps to protect them from little mouths and extend the life of your carrier. These are sold separately. Oscha carriers are made from the highest quality yarns, but as with any jacquard woven textiles, a little bit of care is required to keep your Cairis happy. Spot clean your Oscha carrier and hang to dry where possible. Carriers have many benefits when used correctly, so follow our simple safety guide to get the most out of your Cairis. Always make sure your baby's well supported in the sling without allowing their chin to rest on their chest. Learn more about carrying safely.